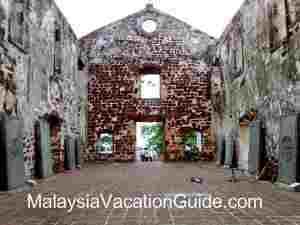 As a famous trading empire since the 15th century, Melaka has became a state where different cultures blend together harmoniously. Apart from local delights, Portuguese and Nyonya cuisine are the main attractions not to be missed in various Melaka restaurants. Nyonya assam fish from one of the restaurants in Melaka. As a gourmet paradise, there are many restaurants in Melaka that let you feast your palate in an extraordinary way. Offering a wide range of food, you can easily find sumptuous local delights of Chinese, Malay and Indian. 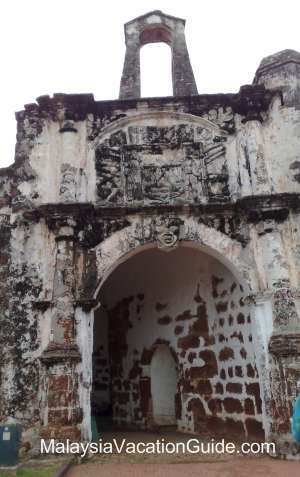 As a multiracial state with influences from both European and Asian cultures, Portuguese and Nyonya cuisine are the signature cuisines of Melaka. 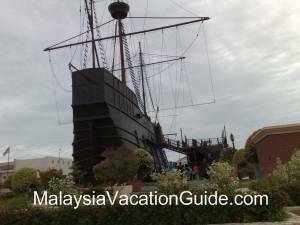 Walking along the streets in Melaka, you will find restaurants that are considered another attraction of this historical city, apart from museums and monument. Mentioning Melaka signature dishes, Nyonya food will certainly be at the top of the list. Originating from a combination of both Chinese and Malay influences in cooking, Nyonya food uses generous amount of spices, coconut milk and shrimp paste (or locally known as sambal belacan) to enhance the taste the taste of food. Once you have tried Nyonya food, you will never forget the irresistible thick gravies with seafood or meat that match perfectly with rice and noodles! 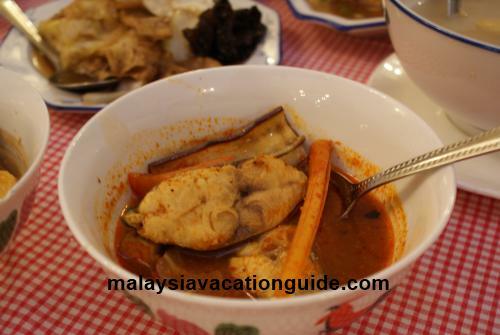 Delicacies like ‘Laksa Lemak’ (noodles with prawn in rich coconut gravy), duck soup and Nasi Kunyit (yellow glutinous rice served with curry) are among the most famous dishes that you can find in Melaka Nyonya restaurants. 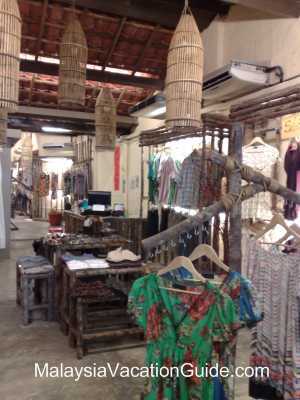 Wide selections of Nyonya restaurants are available in Melaka Raya. Diners can choose from Restoran Bibik Neo located at Jalan Merdeka, Restoran Indah Sayang and Restoran Nyonya Makko in Jalan Melaka Raya. The Peranakan Delight located at Jalan Laksamana, opposite Christ Church is also another choice for Nyonya restaurants in Melaka. 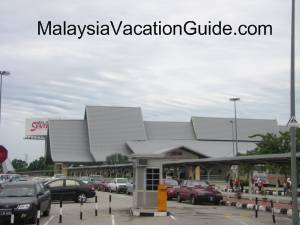 As these restaurants are located not far to each other, you can walk along to select the best Nyonya restaurant of your own choice. Herbs, spices, shallots,lemon grass, vinegar and tamarind juice are vital ingredients in making perfectly authentic Portuguese delicacies. These ingredients give Portuguese cuisines the rich, aromatic and unique flavours. Like Nyonya food, Portuguese cuisine is another famous dish from Melaka as the Portuguese has been influential in Melaka’s history and culture, as well as the cooking style. Several Portuguese restaurants are located at Portuguese Settlement in Ujang Pasir which can be easily reached by local buses or taxi. Papa Joe Restaurant, Restaurant De Lisbon, Celine’s Café and Restaurant Straits Settlement are some selections of Portuguese restaurants available in Medan Portuguese. Dishes like Devil Curry, a hot curry with meat or chicken that cooked by numerous of spices and Portuguese grill spiced fish give you the most authentic taste of Portuguese cuisine without having to fly to Portugal. Another famous and signature dishes from Melaka will be the Chinese chicken rice ball. Choose from succulent steam chicken, juicy roasted chicken, crispy barbeque pork or a mixture of these 3. Unlike the normal chicken rice, Melaka chicken rice redefines the common way of food presentation. In Melaka restaurants, rice is made into golf ball shape, served together with your choice of chicken, green garnishes, special soy sauce and homemade chili sauce. Side dishes like vegetables with oyster sauce, wanton soup, fish ball soup and tofu are good matches to eat with the chicken rice ball. 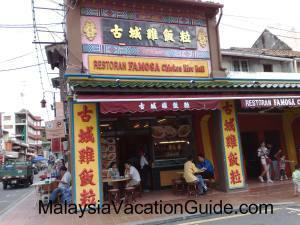 Chinese Chicken Rice Ball is a signature dish you must try whenever you are in Melaka. Along Jalan Hang Kasturi and Jonker Street (renamed as Jalan Hang Jebat), there are several Melaka restaurants selling Chicken rice ball. Restoran Famosa Chicken Rice Ball which is located at Jalan Kasturi offers chicken rice ball with a wide selection of side dishes. The restaurant, renovated as an ancient Chinese house with antique-like furniture provides diners a nice and spacious place to enjoy food. Famous Chicken Rice Ball shop at Jalan Kasturi. Chung Wah Coffee Shop that sells Hainanese Chicken rice ball in a corner shop at Jonker Street, opposite to Christ Church has drag diners from all over the place. With limited seats in the shop, people will queue under the hot sun just to satisfy their wants for the chicken rice. Chung Wah Coffee Shop sells Hainanese Chicken Rice Ball at Jonker Street (renamed Jalan Hang Jebat).Notice the long queue during peak hours. After all the hearty Chicken rice, Nyonya and Portuguese food from the Melaka restaurants, sweet and cooling desserts will be a good choice to complement the delicious local delicacies. Cendol, a green jelly-like dessert, mix with smooth blended ice and melting brown sugar is one of the best desserts one can find in Melaka. 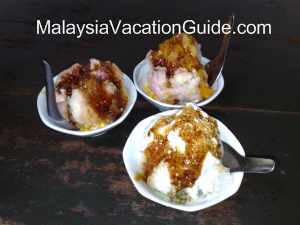 Besides the normal Cendol and Ais Kacang with blended ice and brown sugar, innovative Malaccan has invented Cendol as well as Ais Kacang with durian and mango flavour. No matter as dessert or something icy to quench your thirst after a long walk, both of these will be a good choice for all age group. 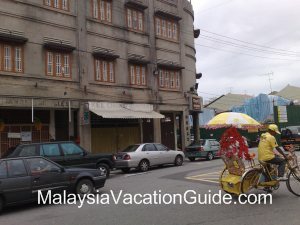 5-minute walk from the entrance of Jonker Street starting from Chung Wah Coffee Shops, you will find a number of shops selling Cendol and desserts in a row. Cendol is taken throughout the day, more so when the weather is hot. As a gastronomic haven, Melaka restaurants are always adventurous. Majority of them are located at Jonker Street (renamed as Jalan Hang Jebat), the restaurants will surprise you with a variety of cuisines. You can always try something new and explore your taste bud without having to venture far. 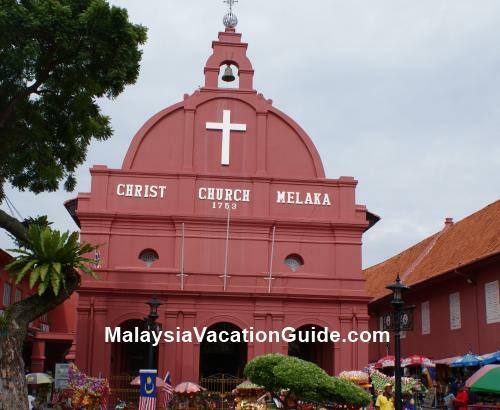 In Melaka, the journey for food will never ends as history and cultures are well-mixed for typical sumptuous Melaka food that cannot be find in elsewhere.